I really love mechanical Valentines. They are vintage cards that have a moving piece that adds special character to the card. They were especially popular from the 1920's to 1940's. I listed a mechanical Valentine today that I absolutely love. It combines everything I like most about vintage Valentine cards. There is a cute dog (a Beagle howling), a sweet child (little 1940's vintage girl who reminds me of the girls in the Moffatt Family series of books by Eleanor Estes), and it is mechanical. You can raise the little girl's left arm to sit on the piano keys as she plays music along with her dog. It is so incredibly sweet! 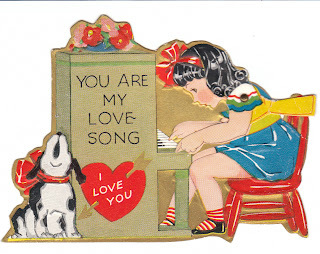 Right now it's located in my store at Piano themed mechanical Valentine here. And of course I have more mechanical Valentines (and many more on the way, the next couple of weeks) in my store: selection of mechanical Valentines at Birdhouse Books.